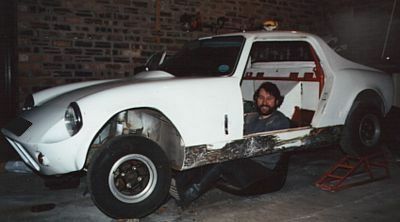 As you can see, the floor is almost non-existent (what's left of it is dragging on the ground) and both sills are 90% detached from the surrounding bodywork (nearside sill supported by the screen support bar only, offside sill is no more than a thin flap of metal at the rear!))... transporting it effectively broke its back... surprising that the screen and 'glass bodywork survived. All in all, not good.. Suppose if an entirely new tub is needed, then why not??! The logbook is fine - dvla computer used to be totally inflexible when given "out of the ordinary" information. I've seen a few kits listed as "twin axle rigid body sports" or similar. What a surprise, it's red underneath! If all the rotten flat panels were cut out and replaced it wouldn't look half as bad, and that'd be pretty easy/cheap to do. IMO. But then again pete, it wasn't the chassis that you were after IIRC. And don't scrap the chassis if you decide not to take it on, i'll give you a few pennies for it as-and-when. Space frame like mine. I would post a pic but cant remember how! Do you have any pictures of the rest of the car. A couple of weekends should see that back on the road ! Thanks, Dino... Are you a mate of Arnie, the bloke I bought it from, by any chance???! He reckoned about 3-4 weeks to put it right!! More at the weekend, weather permitting (it's under a tarp for the first time in eons! ), work calls in the mean time though.. I've removed the main bodyshell (which was far too easy to do..) to find that this "unstressed" part of the Coupe was acting as the main stressed member.. the result of removing it caused each end of the tub to collapse inwards and buckle sideways, so much so that I could not longer push it about on its wheels.. Appears that the tunnel had little or no serviceable metal at either end and therefore no strength.. Both subframes are now off and appear to be ok... the tub is a different story, though.. pics attached.